So last weeks delayed post has now become a double post this week, or at least two weeks worth combined in the one weekly recap. Dominion - Well spoiler alert but I couldn't resist some end of financial specials - and the 2nd edition Dominion big box with Intrigue, was one of my purchases. I've never played a deck builder game before but have always been remotely interested, especially after seeing countless instapics of the Legendary and Harry Potter deck building games. So this week I got to finally play one. Even after reading and explaining the rules, I wasn't entirely sure how Dominion was going to play out and wasn't convinced I really 'got it'. Two turns later and I started to convince our small group that it'd get better and as we kept playing we'd work it out. In reality I was trying to convince myself, but as the next few turns ensued - I was hooked! What a brilliant game! I've only been able to play a few three player games since, but am definitely anticipating delving further and further into the Dominion world and getting to a point where I want to add not only Intrigue, but other expansions. It's just a lot of fun with everyone starting the same, with the same cards to select from and ending up with entirely different decks. Highly recommend everyone give this classic a go! Karuba - Another gaming mechanic that I haven't really ventured far into is tile laying / placement. I've tried Carcassonne, just the once, as a three player game where the other two players knew the game inside out. I don't mind losing a game (actually enjoy it! ), but the lack of rule explanation did not help things and even after a full game I still don't get how you actually score points. So that basically left a bit of a sour taste for the tile laying genre and the great Carcassonne resulting in the fact that I haven't played another one since. Haba is known for their more 'kid friendly' games, so I decided to start fresh with a very basic tile layer and I'm glad I did. Karuba is a simple, fun, well crafted easy to play game that definitely deserves a place in my library as a game that I know I'll be able to play with those who prefer the lighter side of gaming - and I'll still be having a good time. It may not hold much interest for me personally for a very long time, but its definitely an excellent choice for a gateway game and will be an easy one to bring to the table (which is reflected by the 6 plays in one week). Timeline: Historical Events - Simple concept, minimal execution and a great 10 minute distraction. Place four cards about historical events on a timeline in their relative order of occurrence. Place one of your four cards incorrectly in the timeline and your forced to draw a new one as you race your opponents to get rid of your cards first. This game is one of the easiest to teach and while it lacks any real depth, it's just fun learning and outsmarting friends while you do it. There are enough cards included to last a few games before you start seeing repeats, but the more you play the more you'll memorize the dates which will definitely impact the fun of Timeline - however that's where this comes into effect..
Timeline : Science & Discoveries - The same game but with a different theme. The Timeline cards are all part of a series that can be combined and expanded on which each new set, to add more replay value before you have all of a set memorized. My own personal taste inclines me to prefer the earlier mentioned Historical Events, but that's only due to my lack of general science knowledge and care. History just resonates a little more with me, but by adding the two together made Timeline a better overall game. Imhotep - Pretty sure this Egyptian themed game has won a few accolades for putting its own spin on a worker placement game. There's a few unique ideas that lead to some interesting decisions that make it a worthy edition in the library at the moment, but my initial play didn't leave me with a particularly amazing feeling. I've just had the one play so it's still too early to judge but after we finished our first play through I more considered Imhotep a neat game rather than a brilliant one. Its got me curious enough to play some more and I'm invested enough to want to explore some different strategies, so overall I'd say its a win. However with too many new games recently purchased, Imhotep isn't rushing to the top of the pile I'm itching to get back on the table, but I definitely know I'll play it again. 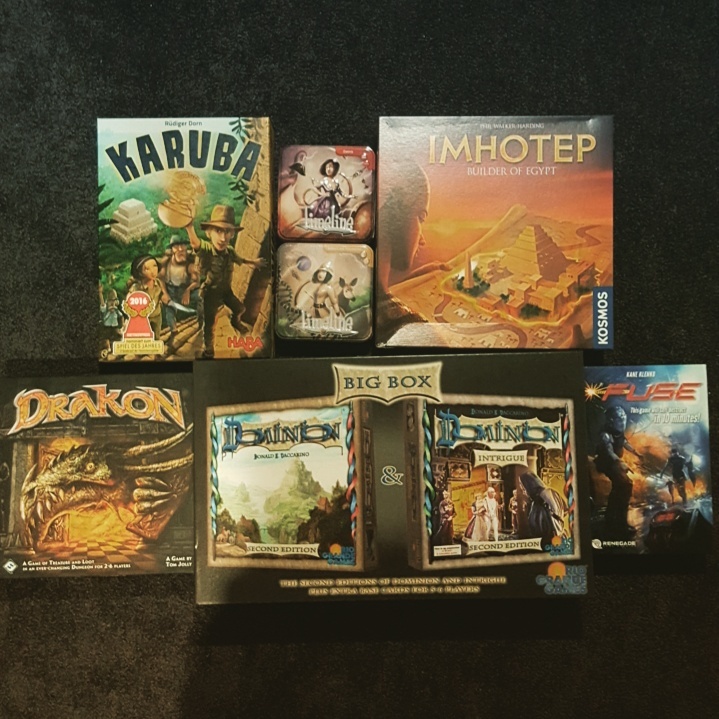 Dominion Big Box - I purchased the second edition of Dominion Big Box which while having a ridiculously large box, also includes one expansion - Intrigue. As written earlier, I'd never played a deck building game before I made the decision to purchase this classic of a game and let me say it wasn't without reservation. Quite often I've found that 'classic' games of a genre were absolutely amazing for their time and really helped to advance board gaming in new and inventive ways, but sometimes the years aren't as kind to them. Newer games steal and improve on the original concepts, offering far more enticing and attractive ways to play what was once a pioneering experience on the original counterpart. Dominion is seen as the game that started deckbuilding, and now that I've finally played it, I can attest that it does still Dominate. Really happy with this purchase! Karuba - As a keen Instagrammer and follower, I've seen many trends of new board games to spam my feed as a new board game is released. This is definitely great advertisement for publishers and if you make a good looking game, your more likely to have fans taking happy snaps. Karuba is one of those games that got sold to me through Instagram. Without the consistent bombardment of picture after picture of tiles, treasures, temples and meeples - I succumbed and bought Karuba for myself. First purchase from Haba and also my first tile placement game in the library. Timeline: Historical Events - I've not only eyed off Timeline for a while, but have also had it in my online shopping basket too many times to count. Need to spend that little bit extra to qualify for free shipping? Throw a version of Timeline in the basket and it'll get you an extra $15-$25 at most online stores. Not sure how I got around it in the past, but before finalizing the order, Timeline was always removed and put into the trash from my virtual cart. Well this time the sales were calling and at $12, this was just an outright purchase and not something used to satisfy free shipping requirements. Timeline: Science & Discoveries - Knowing you could combine the Timeline series for a longer lasting game, I pretty well knew if I was going to buy one of the series I'd at least get another. This theme was the one on sale that seemed to appeal to me most (my gut instincts were a bit average this day), and now it sits as the lesser version of Timeline in the library. For $12 I'm not complaining though! Imhotep - This was cheap, I was somewhat interested and now I own it. I guess that's what sales are all about and it worked on me. At full price I doubt I'd have purchased Imhotep as it wasn't personally over appealing, which most likely has effected my somewhat tempered thoughts after a first experience, but for now Imhotep is in the library to stay until I can make some further judgements after a few more plays. Fuse - I love realtime games. You know exactly how long you are going to be playing for before you start the game and they are also some of the most intense board game experiences. I currently have Escape (very accessible) and Space Alert (rarely played) in the library and felt Fuse could find a place in between those two games for a bit more of a serious realtime experience that's still easy to play. Yet to try it, but hope I was right. Drakon - Marketing strikes again. This time not in advertising but just in the fact that this game was ridiculously cheap to purchase. It's got a few cool components, based in the fantasy theme which I love, and it was like $15. How could I resist? I actually don't know much about this game and can't recall ever seeing or even hearing of it before, but now I can say I'm the proud owner of a Drakon.